The tradition of celebrating Shakespeare’s genius in Stratford-upon-Avon with grand luncheons goes back to the Tercentenary festivities in 1864. In a huge pavilion, guests could attend balls, performances and, of course, lunches. 100 years later, official luncheon parties were still being given in honour of the Bard. 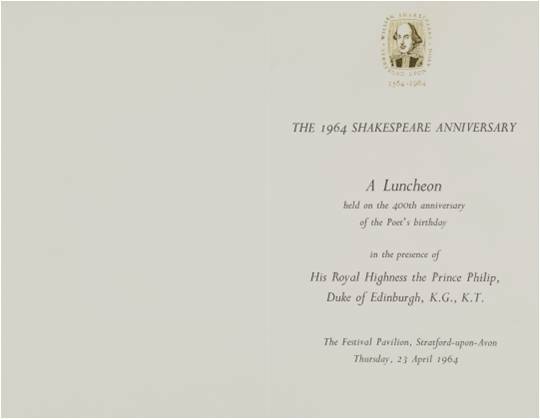 This is the official menu for the 1964 Shakespeare Anniversary Luncheon held in a specially constructed Festival Pavilion on the banks of the river Avon. Originally, Queen Elizabeth II was scheduled to attend the official opening of the Shakespeare Centre on Henley Street that day; however in March 1964 she gave birth to her fourth child, Prince Edward. Her husband His Royal Highness Prince Philip, Duke of Edinburgh participated in the official opening of the Shakespeare Centre in her place. Prince Philip was also the guest of honour at the birthday anniversary luncheon. The menu served on this day consisted of smoked river trout with horse-radish sauce as starters; cold breasts of roast spring chicken, York ham, points of asparagus, fresh green salad, and hot buttered new potatoes for the main course; and fresh fruit salad or Warwickshire Cream for pudding; coffee was served later. Compared to the usual sumptuous and lavish Elizabethan feasts, this luncheon appears meagre indeed. However, the social function of official dinners has remained very similar to what it was in Shakespeare’s time. They were an expression of social and political power not only for monarchs and nobles but also for people with social aspirations, like the gentry and wealthy merchants. No wonder that Shakespeare – like most of his contemporaries – makes good use of dinners and banquets in his works: in all of his 38 plays, nine banquet scenes are depicted on stage, a further four are mentioned but not shown. As these examples show, feasts and banquets prove a welcome setting to stage power and status for Shakespeare. For most of us, however, feasting is nowadays predominantly concerned with good food and good times. Or, if you want to try your hand at an Elizabethan recipe for Mince Pies, take a look at our Collections team’s Shakespearian Christmas post (http://findingshakespeare.co.uk/a-shakespearean-christmas-with-traditional-minced-meat-pies#sthash.Apro4l7R.dpuf). This entry was posted in 2014 Anniversary Exhibition and tagged 1964, Lunch, Macbeth, Queen Victoria, Shakespeare, Titus Andronicus.